This is not your profile. 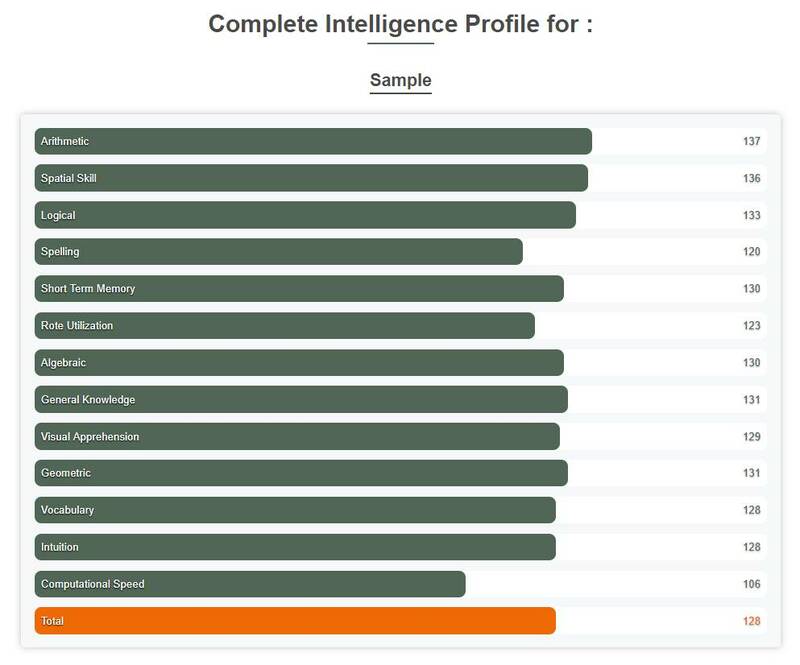 It is an example of what a Complete Intelligence Profile looks like. To see your profile, login to your account and select the option to purchase your profile. Your General IQ Score of 128 shows how able your mind is in general. Anyone with a General IQ Score this high is considered to be of above average intelligence. This score is better than 96.9% of all persons taking this test. Most occupations can be comprehended with a General IQ this high. You should be able to handle almost all academic challenges. You scored higher than your General IQ Score in 8 individual ability categories. 1 of these better scores could be called statistically significant and may indicate special abilities, or that you were distracted on those parts of the IQ Test that counted more heavily in the other ability categories. Your Arithmetic IQ score of 137 is exceptionally higher than your General IQ score. This score is better than 99.32% of all persons taking this test. Your Spatial Skill IQ score of 136 is exceptionally higher than your General IQ score. This score is better than 99.18% of all persons taking this test. Your Logical IQ score of 133 is not significantly different from your General IQ score. This score is better than 98.61% of all persons taking this test. Your Spelling IQ score of 120 is significantly lower than your General IQ score. This score is better than 90.88% of all persons taking this test. Your Short Term Memory IQ score of 130 is not significantly different from your General IQ score. This score is better than 97.72% of all persons taking this test. Your Rote Utilization IQ score of 123 is not significantly different from your General IQ score. This score is better than 93.74% of all persons taking this test. Your Algebraic IQ score of 130 is not significantly different from your General IQ score. This score is better than 97.72% of all persons taking this test. Your General Knowledge IQ score of 131 is not significantly different from your General IQ score. This score is better than 98.06% of all persons taking this test. Your Visual Apprehension IQ score of 129 is not significantly different from your General IQ score. This score is better than 97.34% of all persons taking this test. Your Geometric IQ score of 131 is not significantly different from your General IQ score. This score is better than 98.06% of all persons taking this test. Your Vocabulary IQ score of 128 is not significantly different from your General IQ score. This score is better than 96.9% of all persons taking this test. 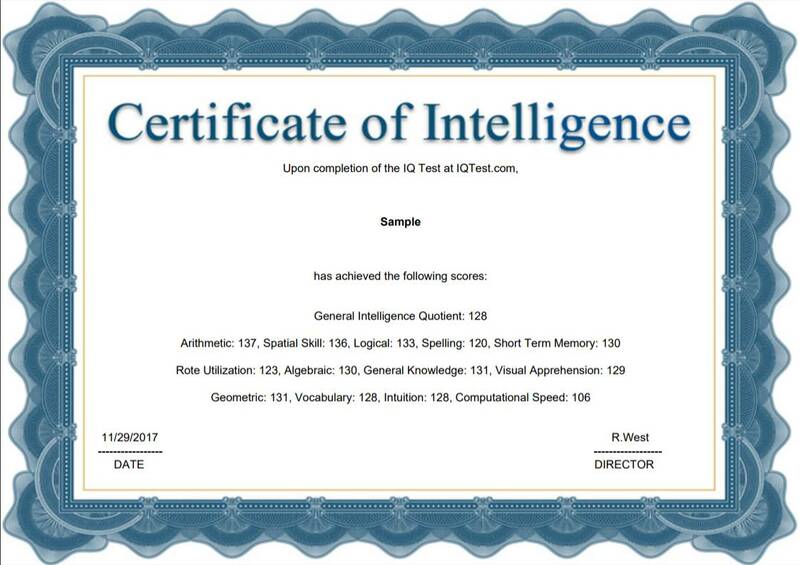 Your Computational Speed IQ score of 106 is significantly lower than your General IQ score. This score is better than 65.54% of all persons taking this test.